The runner-up in the May 20 Venezuelan presidential elections was Henri Falcón, who campaigned to replace the Venezuelan bolivar with the US dollar, institute a severe regime of International Monetary Fund austerity on the populace, and auction off the country’s assets at fire-sale prices to foreign bidders. So what is there not to like about this neoliberal dream for the Trump administration? Answer: it does not go far enough. A far more radical final solution is being promoted by the Colossus of the North. Instead of embracing Falcón as would be expected on account of his economic proclivities, Washington demanded that he not even run in the presidential election and went as far as threatening to impose personal sanctions on him and his family. The US lie that Venezuela is a dictatorship was exposed by Falcón showing just the opposite by running. As it turned out, Maduro was affirmed with a landslide 68% of the vote compared to Falcón’s second place showing of 21%. But Falcón faced the dual challenges of opposition from the left and boycott from the extreme right. A year ago, a rightwing campaign might have had legs had a democratic electoral strategy been chosen. But there were obstacles to such a constitutional transfer of power, besides the popularity of the Bolivarian Revolution started by Hugo Chávez and carried on by Nicolás Maduro. Instead the US and its Venezuelan rightwing allies ultimately opted to achieve by extra-legal means what they could not achieve democratically. Although the Venezuelan economy was showing every sign of tanking, the opposition after it got a majority in the National Assembly in December 2015 demonstrated it had few solutions or even interest in solutions other than dismantling the popular social welfare programs of the chavistas, such as privatizing the 2 million housing units for the poor (subsequently overturned by the courts). Ever fractious, the opposition was divided between a moderate electoral wing and a dominant, more extreme tendency. They could not unify around a single candidate in 2018 no matter how much “democracy promotion” (actually the opposite) dollars were lavished upon them by their US sponsors. And after unleashing the violent guarimbas (protest demonstrations) taking over one hundred lives and destroying billions in public property in the period 2013 to 2017, the opposition did not endear themselves to the swing voter by calling for yet more punishing sanctions on their fellow Venezuelans. Yet all these obstacles for the opposition might have been overcome had their US handlers so chosen. But the chosen course of action from the US is no soft landing for chavismo. Starting in 2015 under Obama, the US unleashed sanctions on Venezuela as a form of economic warfare. These sanctions are illegal by international law because they impose a collective punishment on the people of Venezuela for the actions of their government. Likewise, the sanctions are illegal by the charter of the regional Organization of American States. And the sanctions are illegal by US law, because they are based on the obvious lie that Venezuela is an “extraordinary security threat” to the US, when the opposite is manifestly the case. Venezuela is not conducting multi-national military exercises on the US’s southern border in a rehearsal for an invasion, while the US has done precisely that on Venezuela’s border. Furthermore, the US sanctions are not designed to change some policy to steer the Maduro government in a more advantageous direction as are the sanctions on, say, Iran or North Korea. The sanctions are designed purely and simply to immiserate the people and force the democratically elected government of Venezuela to roll over and die. There is nothing Maduro can do but resist. Prior to the Venezuelan elections, the White House had made noise about imposing an oil embargo if the Venezuelan people dared to ignore the imperial dictate to boycott the election. In a petro-economy such as the one that Maduro inherited from Chávez, who inherited it from the ancien régime, cutting off oil revenues is tantamount to puncturing the aorta. Petrodollars account for 96% of Venezuela’s exports and over 40% of government revenues. Nearly half of the Venezuelan electorate went to the polls on May 30, defying the emperor in the Oval Office and the rightwing boycott. Trump, true to his word, imposed enhanced financial sanctions the day after the election. But he stopped short of directly attacking Venezuelan oil revenue, probably due to concerns about the upcoming mid-term Congressional elections in the US. The Republican base likely knows little about Venezuela and cares less; same for the Democrat faithful who also get their news from the corporate media. But a price spike at the gas pump from a US oil embargo on Venezuela would get the US electorate’s attention. Besides the already in-place US sanctions have cumulative effects that will only increase the pain in Venezuela even if the empire just stays its present course. Venezuelan capital reserves are being exhausted. Already oil production in Venezuela has fallen as access in the international market to replacement parts is cut off, crippling productive capacity. The US is trying to precipitate a “humanitarian crisis” as an excuse for intervention, all the while hypocritically lamenting the consequences of its own policy. If Venezuela were really a failed state, as the US claims, then there would be no need to impose sanctions to make it fail. Another factor boding against Venezuela is its hostile neighbor to the west and Washington’s main Latin American client state, Colombia. This country is distinguished as the largest source of illicit drugs into the US yet is the largest recipient of US aid in the hemisphere. That is, the country most materially damaging to the US is the one most favored, despite (or really because) of its record as the worst human-rights abuser in the Americas. Sharing a 1378-mile border with Venezuela, Colombia just joined NATO as the first “global partner” from Latin America. And that was under the moderately rightwing Santos government. Colombia will have a presidential runoff election on June 17 pitting the far-right Iván Duque against the left-of-center Gustavo Petro, with the former favored to win. A US-backed coup in Chile overthrew the democratically elected government of Salvador Allende on September 11, 1973. Preceding the coup, which took Allende’s life, was a US-orchestrated economic destabilization effort, a prequel to what is now being visited upon Venezuela. Succeeding the coup in Chile, thousands of leftists and suspected leftists were rounded up and summarily executed to root out insurgency. The Chilean coup and its aftermath is the template for the US and the sycophantic domestic Venezuelan opposition for the extermination of the Bolivarian Revolution. That is, a violent takeover, the elimination of their enemies, and the blitzkrieg imposition of neoliberal shock therapy. Only in Venezuela, this reactionary political cleansing could be much uglier than Chile. Allende was in power for only three years; the Bolivarian Revolution is nearing its second decade. The social-democratic Allende government made important changes, but they pale in comparison to the depth and breadth of the accomplishments of the socialist administrations of Chávez and Maduro. Maduro won reelection on the promise that he would right an economy that has been spiraling downward with decreasing production, runaway inflation, chronic corruption, pervasive shortages of consumer goods and medicines, and a dysfunctional currency exchange system. This could be the best and last chance for the Bolivarian Revolution in Venezuela to meet this daunting challenge in the face of US and domestic hostility. Maduro, riding on back-to-back electoral chavista victories (presidential, municipal, gubernatorial, and Constituent Assembly) has taken the initiative to seek a peaceful solution by convening a national dialogue. In the last week, Maduro met with Apostolic Nuncio Aldo Giordano, the Andean Development Corporation, the National Banking Association, private and public media outlets, and even Republican Bob Corker, chair of the US Senate Foreign Relations Committee. Some 80 opposition activists, jailed for violent actions, were freed. Maduro also met with third-place presidential candidate Javier Bertucci, major opposition COPEI party leader Pedro Pablo Fernández, and opposition governors. Meetings with the popular sectors including left intellectuals and communards are in progress as well. Polls indicate the vast majority of Venezuelans oppose the sanctions and outside military intervention. The over 6 million poor and working people, who have suffered most from the sanctions, are the ones who reelected Maduro and remain militantly identified with the Bolivarian Revolution, which has empowered them. The poor and previously dispossessed chavistas literally have nothing to lose and everything to gain by resisting an extra-parliamentary rightwing takeover of their country. If Trump were to prevail in his present course for Venezuela, the bloodletting could be horrific. 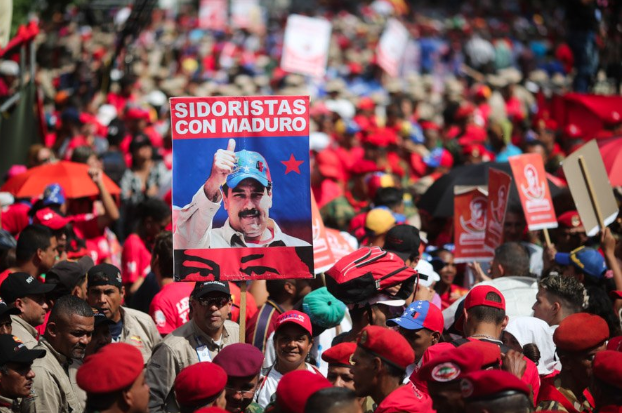 Maduro’s election slogan – juntos todo es posible (together everything is possible) – must be embraced by the international peace community in rejecting outside interference in Venezuela.